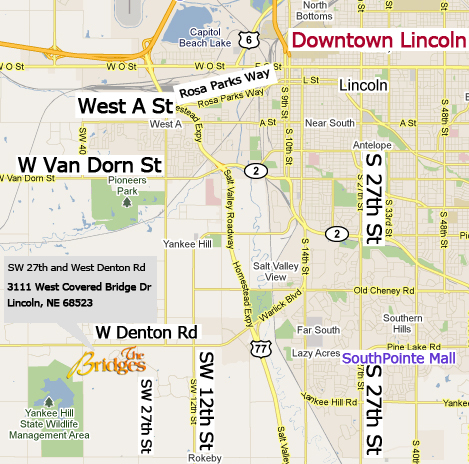 The Bridges is conveniently located centrally in the Lincoln, Nebraska area only 10 minutes from downtown Lincoln and Memorial Stadium, as well as only 10 minutes from the popular upscale shopping, dining and entertainment at Southpointe Pavillions. 1.) Take West Denton Road 4 miles west to S.W. 27th Street. 2.) Turn south on S.W. 27th Street. 3.) Take the first right, south of West Denton Road. 4.) Enter through the large covered bridge.